Since I’m not much of a baker, I rely on a few tried and true desserts for entertaining, but none is as popular with my friends as these soft chocolate pudding cakes. The recipe is adapted from Rosa Mexicana, a wonderful New York City restaurant that I had the pleasure of dining at last year. 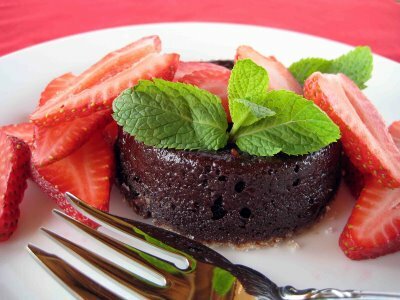 Strawberries are in season now, and are delicious served with the chocolate cakes (maybe even with some whipped cream, although it’s not needed because the cake is so moist). I’ve made this cake without the flour and it turns out fine if any of you are looking for gluten free recipes. Enjoy! Preheat oven to 325Â°F. Butter eight 6-ounce ramekins and dust with sugar, knocking out excess. Bring orange juice and sugar to a boil in a 1- to 1 1/2-quart saucepan, stirring until sugar is dissolved. Pour hot syrup over chocolate in a large bowl, whisking until chocolate is melted. Add butter one piece at a time and whisk until melted. Add eggs 1 at a time, whisking after each addition, then stir in chile paste, flour, and salt. Divide among ramekins and bake in a hot water bath on the middle rack of the oven, uncovered, until just firm and top is starting to crust, 50 to 60 minutes. Transfer ramekins with tongs to a work surface and let stand 2 minutes, and then unmold warm cakes directly onto dessert plates (they will be difficult to move once they adhere). 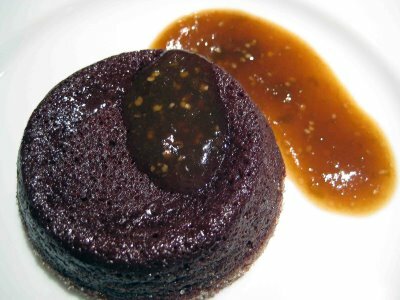 If you want to keep with a traditional Mexican themed meal, skip the strawberries and make this unusual sweet tomatillo sauce to accompany the cakes. Combine all ingredients in a small saucepan and bring to a boil. Reduce heat, cover and simmer for 20 minutes, or until soft. Remove cinnamon stick and vanilla bean. Pour remaining sauce into a blender and purÃ©e.